Background: Spiro skeleton is an important structural motif in natural products, usually accounting for their formidable architectures and remarkable biological profiles. Recent advances demonstrated that a diverse range of scenarios held the promise for the assembly of spirocenter based on ortho-dearomatization strategy. 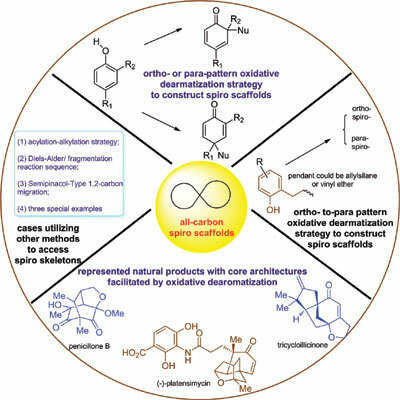 In this article, we describe the latest development of ortho-dearomatization reaction in constructing spirocyclic scaffolds with an all-carbon ring junction from a methodological standpoint. Objective: The review focuses on recent progress in the area of ortho-dearomatization reaction in constructing spirocyclic scaffolds with an all-carbon ring junction. Conclusion: In summary, we have summarized the capability of ortho-dearomatization reaction to construct spirocyclic skeleton, a common structural pattern found at the core of numerous natural products with broad structural diversities and important bioactivities. Success in this area will benefit not only the area of synthetic chemistry through methodological development, but also medicinal chemistry and chemical biology by providing access to rapid assembly of bioactive compounds’ core scaffolds. Spiro compound, ortho-dearomatization, oxidative rearrangement, natural product, synthetic methodology, total synthesis.